Even as more people are seeking outpatient treatment at the Institute of Mental Health (IMH), more than five in 10 respondents in a recent survey indicated they are unwilling to live with, live nearby or work with a person with a mental health condition. The survey, which is the first of its kind by the National Council of Social Service (NCSS), found that most people agree that more needs to be done to reduce societal stigma, yet they are also reluctant to accept them on an individual level. 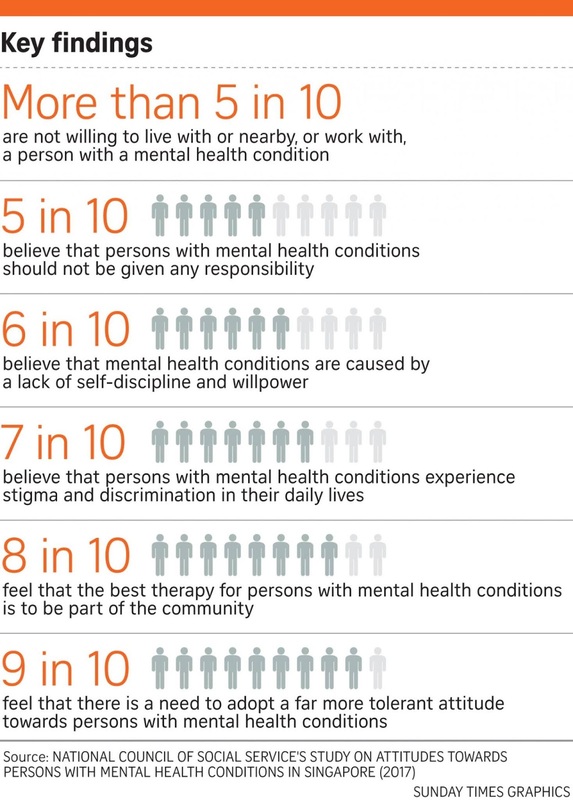 In the survey of 1,796 people conducted last year, six in 10 people said they believe that mental health conditions are caused by a lack of self-discipline and willpower, while half believe that persons with mental health conditions should not be given any responsibility. 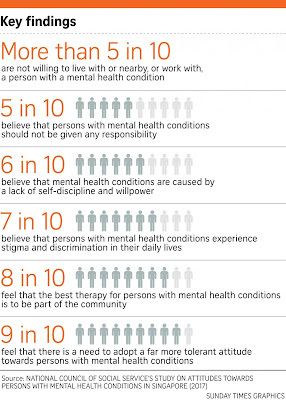 But seven in 10 respondents acknowledged that persons with mental health conditions experience stigma and discrimination in their daily lives, and eight in 10 said they believe the best therapy is for them to be included in society. The findings, which were released yesterday, highlight the misconceptions and stigma suffered by persons with mental health conditions. This will lead to their withdrawal from society and discourage them from seeking help, said Professor Chua Hong Choon, chief executive of the IMH. "It's a vicious circle - when they don't seek help, their condition deteriorates," Dr Chua added. "It is only when their condition worsens that they come to IMH and recovery will be more challenging then." Last year, nearly 43,000 people sought outpatient treatment at IMH - a 22 per cent increase from the figure in 2010. And a Singapore Mental Health Study conducted in 2010 by IMH showed that one in eight adults here has experienced a mental health condition in his lifetime. To combat stigma, a nationwide, five-year public education campaign by NCSS was launched yesterday at the Mental Health Festival. The festival was organised by IMH to mark its 90th anniversary. The Beyond The Label campaign, funded by the Tote Board Mental Health Strategic Initiative, will feature five Singaporeans aged 24 to 36 years old who are currently in recovery from mental health conditions, such as depression and schizophrenia, and have taken on the role of ambassador for the campaign. Their stories will be shown across Singapore, such as on public buses and at MRT stations, from this month till November. NCSS will also be working with partner groups to counter stigma towards mental health conditions. Speaking at the launch yesterday, Deputy Prime Minister Tharman Shanmugaratnam said he hopes the campaign will show that persons with mental health disorders can be active contributors to society, and urged Singaporeans to include those with mental health conditions in society, rather than shut them out. Ms Porsche Poh, executive director of mental health advocacy organisation Silver Ribbon, said the campaign should be in different languages and even dialects "to reach out to the elderly population as well". Peer support is crucial in helping people with mental health conditions in their recovery, as they know they are not alone. This is one of the reasons why Ms Sumaiyah Mohamed, 30, and Mr Desmond Ng, 24, are now well on their road to recovery, after they were diagnosed with both schizophrenia and depression in their teens. Ms Sumaiyah and Mr Ng are two of the five ambassadors for the Beyond The Label campaign launched yesterday by the National Council of Social Service. Both developed symptoms of mental health conditions after making the tough transition to new schools. When she was a 19-year-old freshman studying psychology at the National University of Singapore, Ms Sumaiyah put great pressure on herself to do well. She obsessed over her assignments and exams, lost interest in her hobbies and, at one point, suffered from insomnia for a week. When her exams were finally over, she holed up in her room, refusing to eat or drink, and experienced psychosis, referring to her father as the Prophet Muhammad. Her friends and former teachers visited her when she was warded for two months at Changi General Hospital. She is now a programme coordinator at Club Heal, which gives counselling to those with mental health issues, and is married with a two-year-old daughter. Similarly, Mr Ng started hearing voices and hallucinating when he was 18. He was then a second-year accounting student at Ngee Ann Polytechnic. "I would get paranoid about others, and there was a voice telling me to hurt others," he said. "I would also get panic attacks around people, which I had before but not to this extent." He was reluctant to tell his relatives about his condition at first. However, he eventually opened up to them, and found that some had gone through mental health challenges as well. "It helps a lot to talk about it, because others and even you will realise that you're not alone and these conditions are quite common," said Mr Ng, who is now a peer support specialist at the Institute of Mental Health.